Worldwide Asset eXchange announced the results of a new study showing online gamers’ pent up demand for using cryptocurrency to enhance their video gaming experience. WAX surveyed 1,000 gamers in the United States who have previously purchased, sold or traded virtual items online. Around 5 percent of millennials have invested in various cryptocurrencies, according to a recent London Block Exchange report. WAX found that an incredible 55 percent of millennial gamers have already used cryptocurrencies. WAX’s study found that greater than 50 percent of respondents in the U.S. already own cryptocurrency. However, 87 percent have not used it in video gaming before and 80 percent are interested in using cryptocurrency to make transactions within video gaming. Close to two-thirds wish there were more opportunities to do so. The global nature of the online video gaming community coupled with the tech-savviness of the millennial generation means the adoption rate of cryptocurrencies within video gaming should only increase with time. 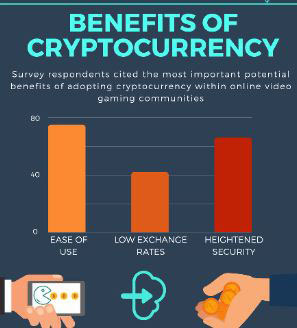 Gamers see many potential benefits to be gained from using cryptocurrency in video gaming, with over 75 percent of gamers citing increased ease of use as a major benefit. Additionally, 66 percent expressed interest in the heightened security and 49 percent would enjoy the faster processing speeds. Furthermore, 42 percent like how cryptocurrency radically reduces exchange rates and 44 percent desire lower transaction fees.